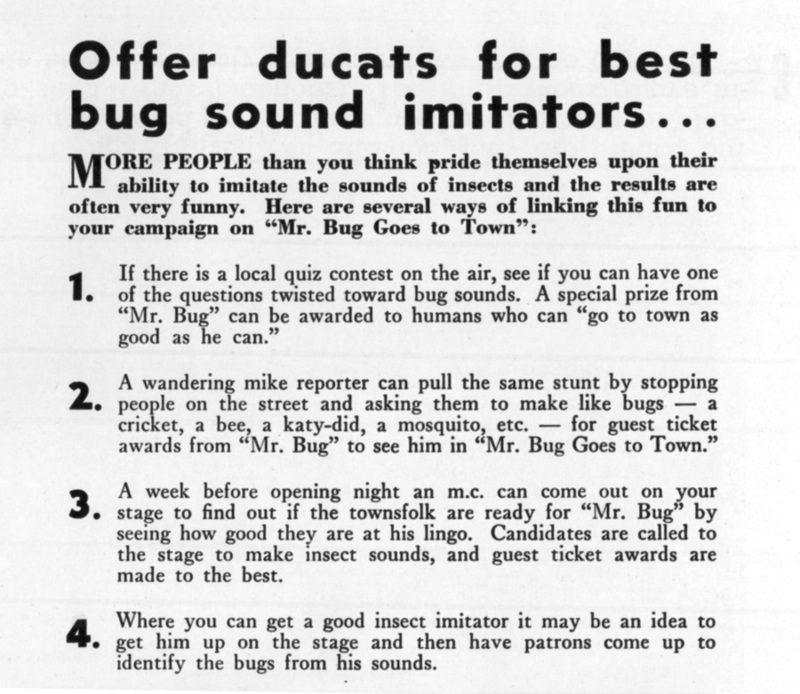 Welcome to the third - and final - installment of our exhibit about the making of Mr. Bug Goes to Town! 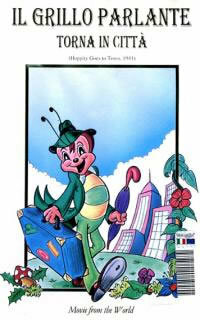 In Part One we looked at the creation and development of the story line that would become Mr. Bug Goes to Town. In Part Two, we explored some of the technical innovations and ingenious problem-solving that went into the making of the film. In Part Three, we'll take a look at the film's fascinating, at times complicated, journey to the silver screen against the backdrop of America's entry into World War II. It is commonly believed that Mr. Bug Goes to Town had been scheduled to open to the public in early December 1941, three days before the Pearl Harbor attack. While this has been long presumed to be what occurred, the truth is…. that isn't what happened at all! From a Paramount Promotional brochure. 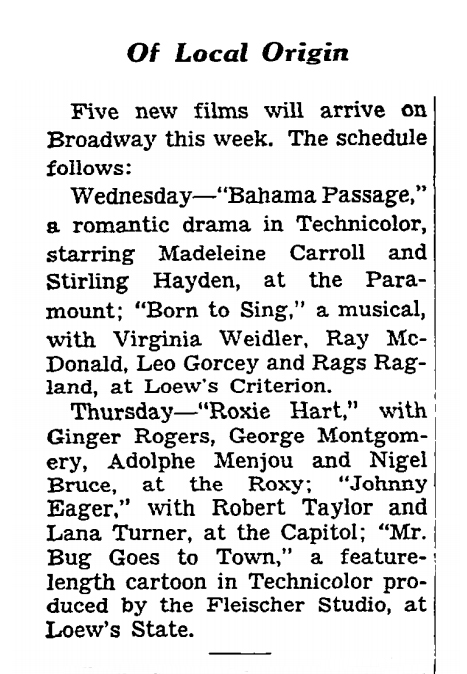 Announcement of Press Screenings in "Showmen’s Trade Review" November 22, 1941. In fact, the film was not shown publicly until January 23, 1942... in England, which was already well into the midst of World War II (England entered the War in September 1939.) 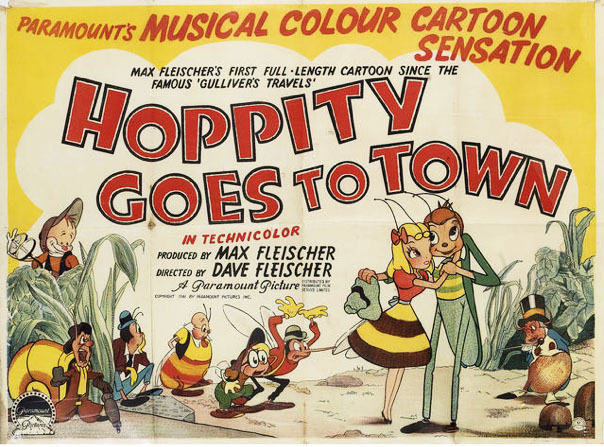 Not only was the first public showing in England, it was also under a slightly different title: Hoppity Goes to Town. The Miami News announces the first local showing of Mr. Bug March 9, 1942. Why was the opening delayed? Though we haven't uncovered any clear reason for the delay, we can offer some educated speculation as to what may have happened, and why. 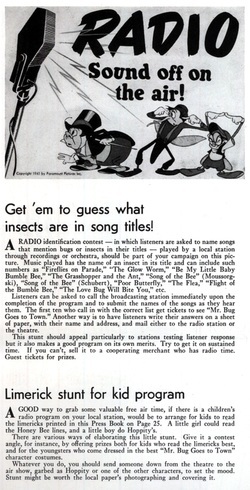 Until recently, the reason most often put forth for the delay is that entry of the United States into World War II on Dec 7, 1941, just three days after the film’s opening, left the public in no mood for the trials and tribulations of a colony of cartoon insects. But as we now know, the December showings of the films were trade-only showings; and in fact, there was no public showing of the film scheduled for December 1941 at all. It may simply have been that the Studio was running behind schedule due to a heavy workload. The Studio had agreed to Paramount’s request to produce the new Superman series, the first film of which opened in September 1941, followed by almost monthly releases of the eight remaining Fleischer Superman films. The Studio was therefore in production on BOTH a major new feature and the new, labor intensive, Superman series at the same time. 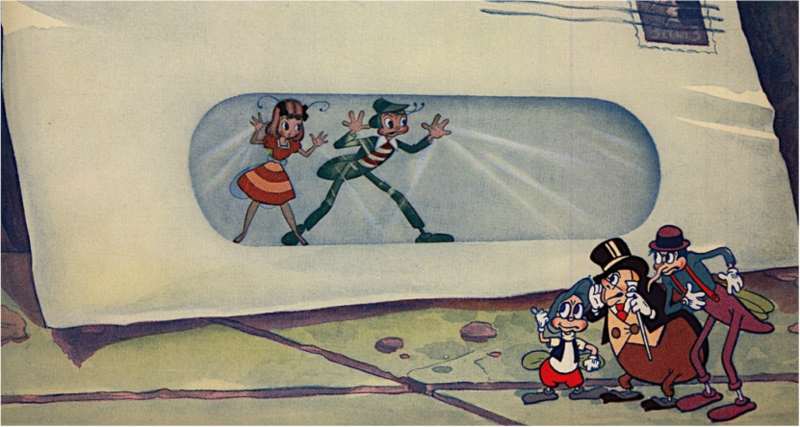 It has also been proposed that the delay may have been an effort to avoid competition from Disney's Dumbo, which had opened on October 23, 1941 to much fanfare and sustained popularity. 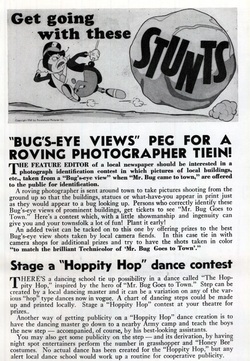 Although World War II may not have been the cause of Mr. Bug's delayed opening, its overall effect on the life of the film cannot be overstated. 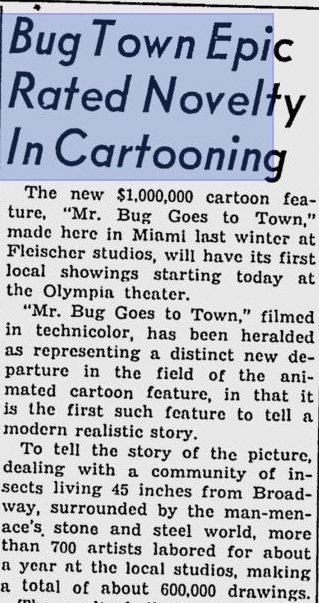 An article in Variety dated January 28, 1942 stated that Fleischer Studios would discontinue feature length cartoon production for the duration of the war owing to shortages of some materials that "created difficulty in creating Bug." The article goes on to suggest that these shortages may have contributed to the delayed opening of the film. The film industry overall was negatively impacted by World War II. By the time the United States entered the War in 1941, the entire film industry was already feeling the impact of the reduced availability of overseas markets. Why all the different titles? As it turns out England wasn't the only place where the title of the film was altered. But why? As often happens, the translation of words is one thing, but the translation of meaning is another, often impacted by differences in linguistic idioms, historical reference points, and sometimes even cultural reference points! 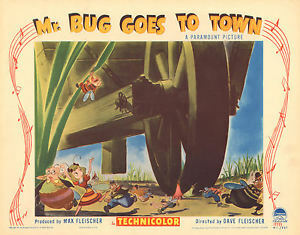 In the U.S.: "Mr. Bug Goes to Town"
Mr. Bug Goes to Town, the film's original title, was a word-play on the popular American film, Mr. Deeds Goes to Town, starring Gary Cooper. 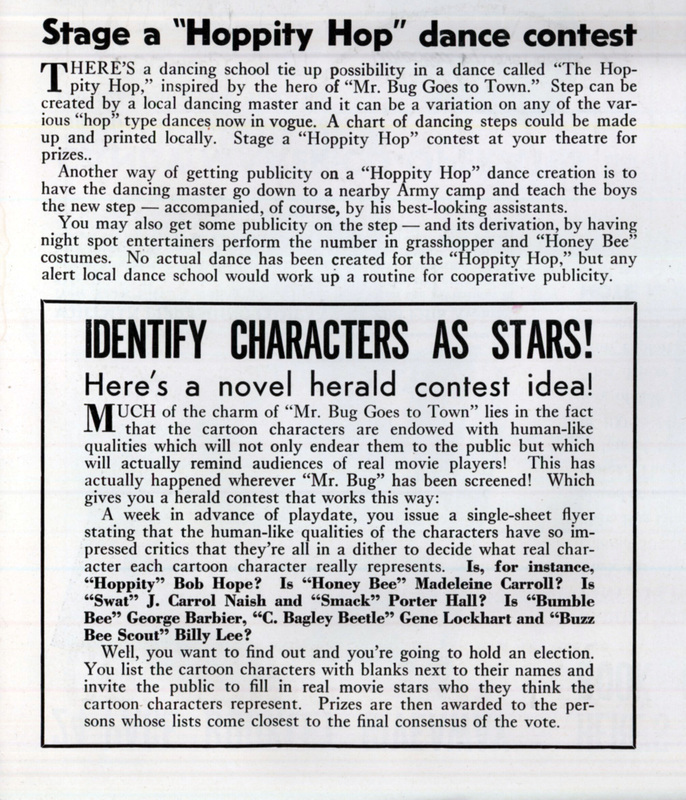 Because of this, some people has assumed that the main character, Hoppity, is based on Gary Cooper’s character in Mr. Deeds Goes to Town, but this is not the case. Though Hoppity’s good and honest personality is, without doubt, reflective of Cooper’s character in Mr. Deeds, the plots of these two films are entirely different. 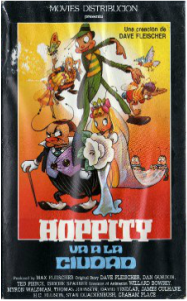 In light of all this, the decision was made to release the film in England as Hoppity Goes to Town. (This same title has also been sometimes used on re-issues of the film on both DVD and laserdisc in the U.S). 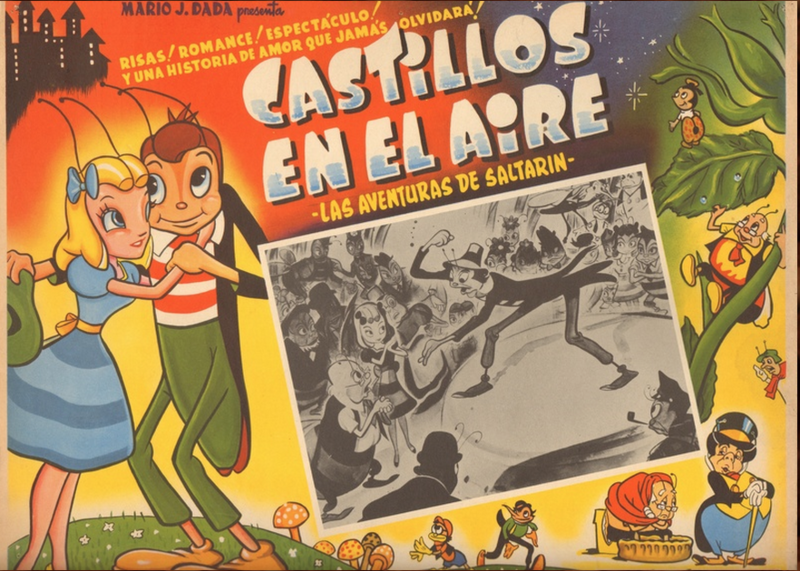 In Argentina, and elsewhere in Latin America, the film was released under the title Castillos en el Aire, which translates to "Castles in the Air." ​This was likely a reference to - and twist on - “We’re the Couple in the Castle,” one of the songs written specifically for the film. The lyrics of the song also foreshadow the ultimate fate of the residences of Bugville who find their new home in the midst of an elaborate penthouse garden. 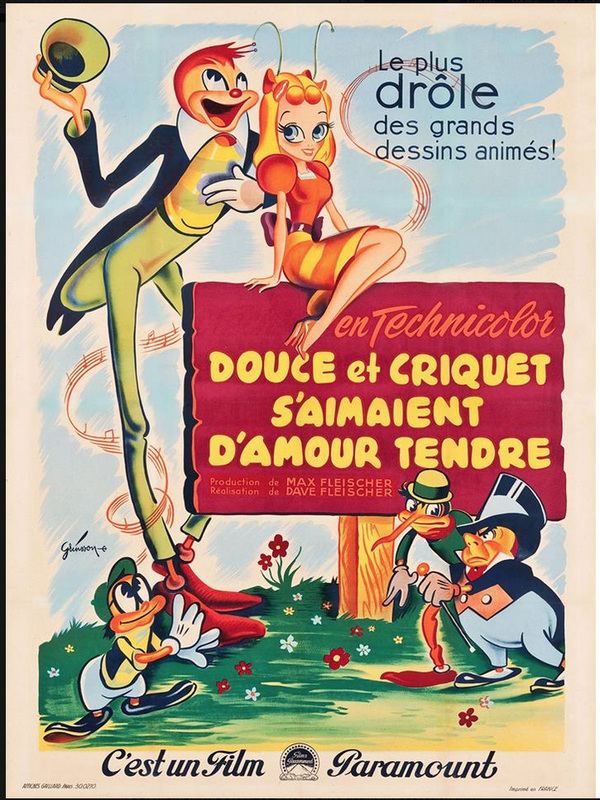 In England: "Hoppity Goes to Town"
In Latin America: "Castle in the Air"
In France: "Sweetie and Cricket Loved Each Other Tenderly"
In France the title became Douce et Criquet S’aimaient D’amour Tendre, which translates to "Sweetie and Cricket Loved Each Other Tenderly." (Thanks to Billie Towser posting this on Facebook!) For some titles we simply don't have an explanation! 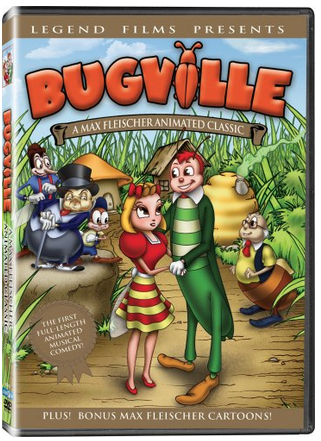 When the film was released as home video/DVD by Legend Films it was renamed once again, this time as Bugville, a reference to the name of the insects' little town in the movie. 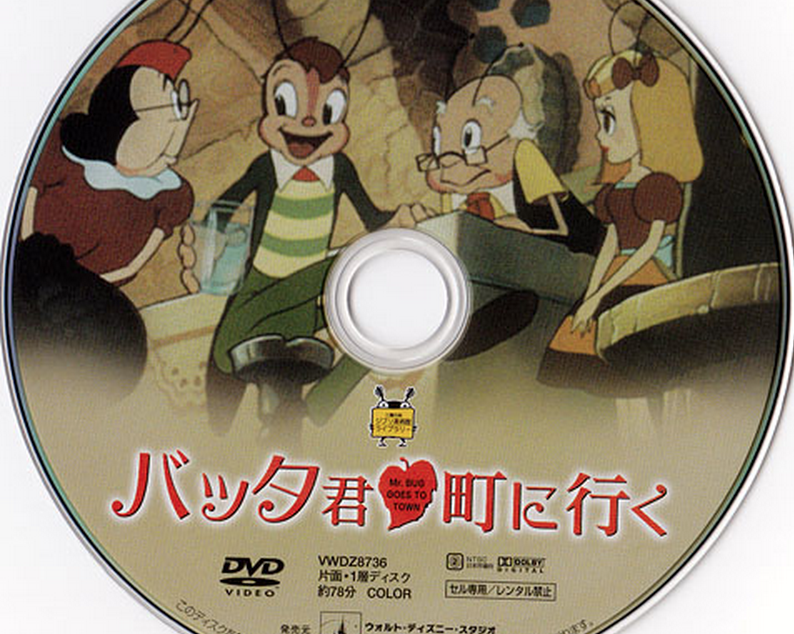 In 2009, Mr. Bug was released in Japan (with Japanese sub-titles) as part of Studio Ghibli’s Ghibli Museum Library. 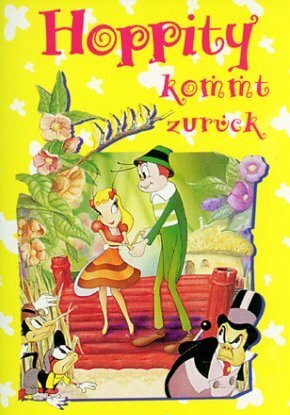 As you can see from the posters, video cover and DVD cases below, though the title may change, the film remains the same. 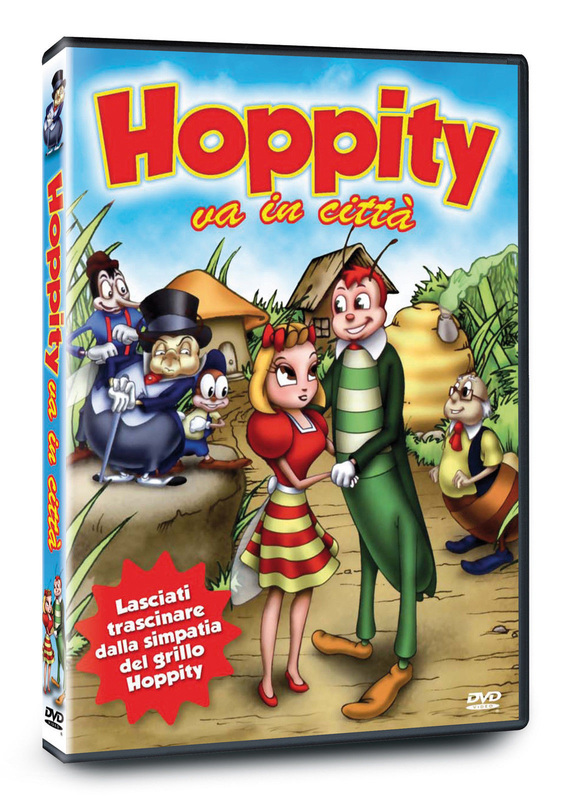 Hoppity and his friends have found their way into the hearts of fans around the world. 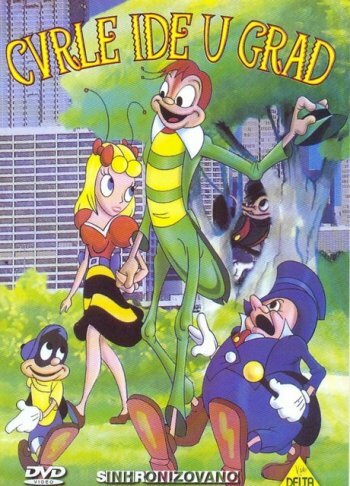 U.S. DVD re-release of the film under the title "Bugville"
Croatian: "Crik-tee Goes to Town"
Spanish "Hoppity Goes to the Town"
Italian: "Cricket is Back In Town"
Italian: "Hoppity Goes to Town"
Mr. Bug Goes to Town has a well-earned place in the history of animation. It’s been loved through the years by children, adults, and animation professionals. Today the film has taken on a somewhat cult-like status among a new generation of animators and animation buffs. We are pleased and very grateful for the opportunity to share some of the wonderful art that went into the making of Mr. Bug Goes to Town, courtesy of animation collectors Ryan and Stephanie Englade. 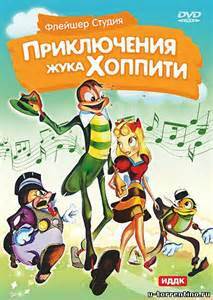 The Englades collect a wide range of animation art and it is our good fortune that they have a special fondness for Mr. Bug Goes to Town. 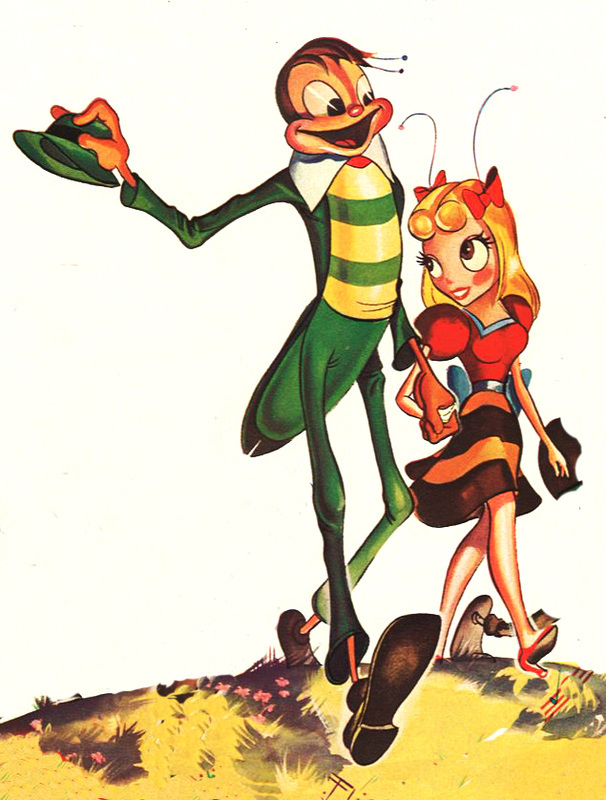 ​To enjoy their full collection of Mr. Bug, as well as some of their other animation art, visit their Animation Art and Cel Gallery. 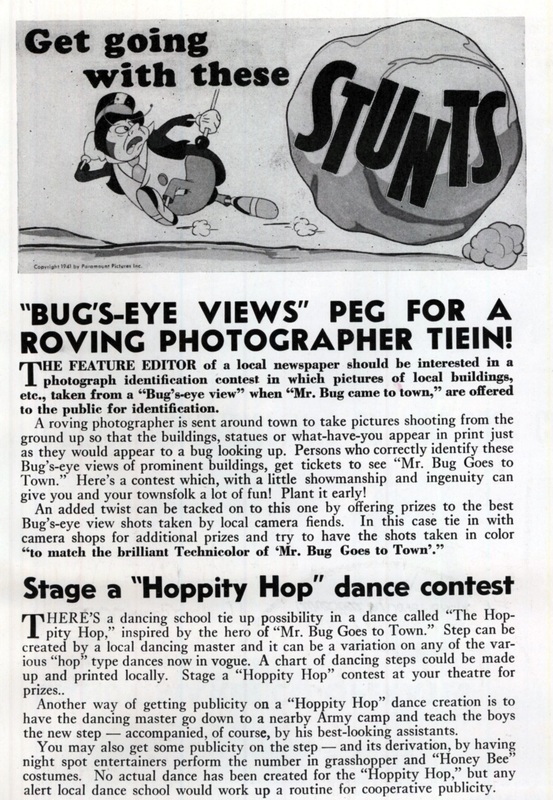 ​Check out these fun promotional ideas (right) in the Mr. Bug booklet that Paramount provided to theaters, offering them strategies for drawing in audiences by engaging them in bug-themed activities like Hoppity Hop dance contests, bug sound imitation contests, limerick writing and more! While we don't see these sort of games at the theater anymore, they may be just what you need for your own at-home screening party! 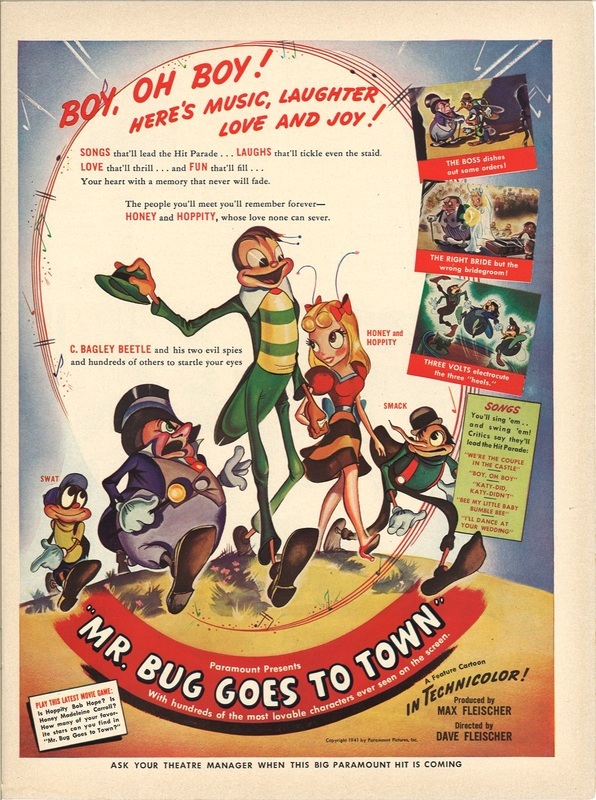 With so many films already posted on this site, why haven't we posted Mr. Bug Goes to Town? While we are not able to post the film here, it is available and we encourage you to discover and enjoy this charming and very special film. Haven't viewed Parts 1 and 2? Check them out!